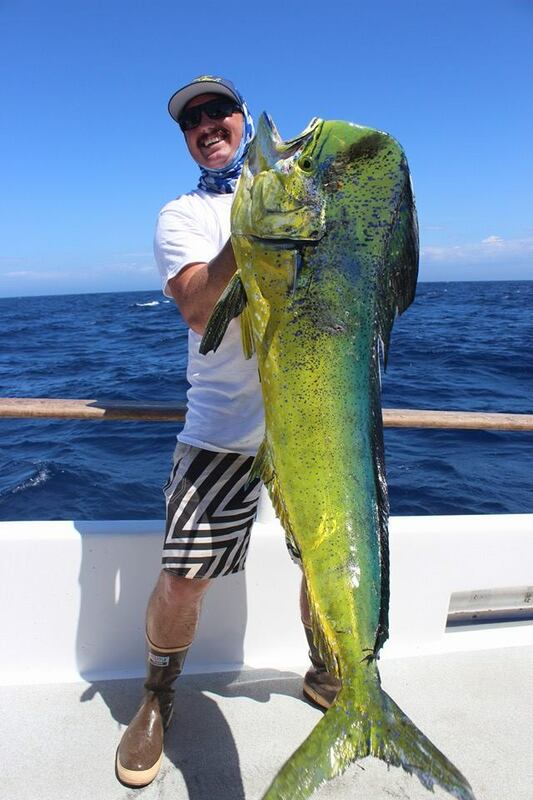 Home / Fishing / Fishing Gear / If You Clean Fish – Read This! If You Clean Fish – Read This! Love it or hate it – a day of fishing leaves you all kinds of smelly. And the more successful the trip… the thicker the stench. Now, you may relish in this “smell of success” but chances are high that your significant other and family have a slightly different opinion. If you’re really honest with yourself, when the day is done… it is time for the fish stink to be gone – just ask any commercial fisherman… or his wife! Add to that – the burden of every piece of clothing you wore reeking of fish. fun rolling… not be a buzzkill for everyone around you! Capt. Scott Goodwin said, “I always heard it from my Mom growing up, “Why does fishing have to stink?” she would say in exasperation as she graciously dealt with my fishing clothes and buckets of forgotten bait. Then my wife dealt with the smell of my “charter” clothes for years and still does. Now even my kids survey me as I approach and ask as they keep their distance, “Are you clean? Or do you stink!” That makes three generations that have dealt with the smell of fish on my hands, clothes, shoes, you name it. However, one woman from Carlsbad, California has discovered a natural solution that is getting a LOT of praise. Tapping the knowledge of an uncle who happened to be a chemist, she tested and experimented with various formulations for years until she had something 100% effective at neutralizing stubborn smells, the worst being fish. Starting locally, she introduced this “Miracle Soap” to the fishing public at San Diego’s popular Day at the Docks in 2003. The first version was in bar form, but soon fans of this unique soap really wanted a liquid version as well. 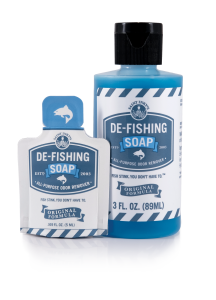 Fast-forward 13 years, De-Fishing Soap is offered in liquid form in a variety of sizes. And it’s used worldwide, not only by fishermen, but all outdoor enthusiasts, mechanics, chefs, and more. gas and diesel, or cigarettes. PLUS it is safe for use on clothing, carpet and furniture! The uses truly are endless. Michelle Gandola recounts her first introduction to De-Fishing Soap, “I remember when I first started to work on the sport boats out of San Diego and I would work 15 days on and 2 days off. This was in 2001-2004 when the albacore were still running strong. 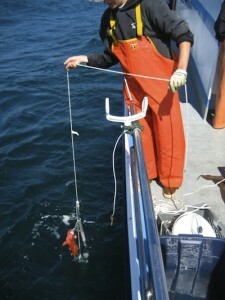 I’m not sure if many of you remember what it’s like to catch an albacore (somewhat joking) but they were abundant in my first year working on the boats and boy did they have their own unique blend of stink! 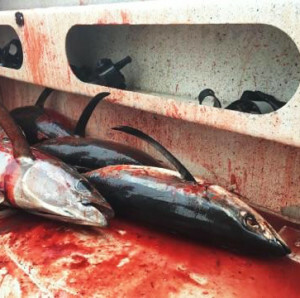 In all my years of fishing, I would say that the albacore-smell is the hardest to wash out of your skin, hair, and clothes. I would come home from trips and would stink to high heavens. I tried everything to get the smell out. I would take long hot showers and scrub until my skin was sore. I tried using different soaps and conditioners. But 15 days straight with only sportboat showers allows that stink to really penetrate. The same went for my clothing. I would wash a load two and three times and still I had to deal with the faint smell of fishy stench. I was fed up! Then I met this lady at the Day at the Docks and she introduced me to her De-Fishing Soap product. I remember thinking, how could this bright blue soap do any better than the products I already tried out. But she was kind enough to give me a free bar, so I tried it out after my next fishing trip. I no longer work on boats, but I keep a bottle at the sink in my house for stubborn smells or when preparing a fish dinner. De-Fishing Soap’s unique blend of star anise, Australian tea tree oil and other secret ingredients don’t just cover up strong smells, it neutralizes them at their source. 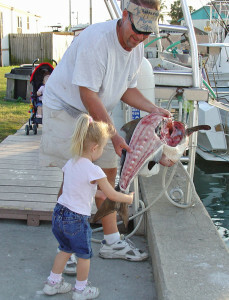 De-Fishing Soap works on all fresh and saltwater fish and bait, guaranteed! 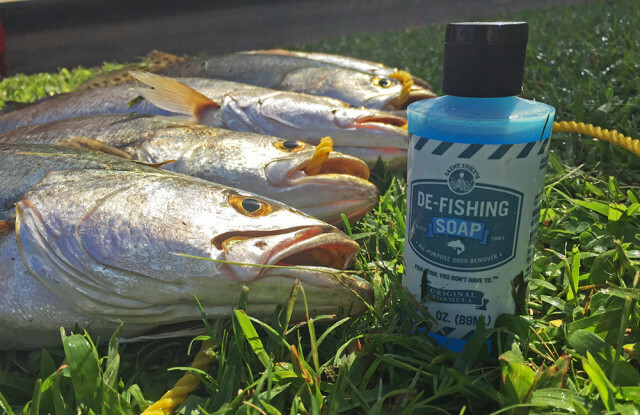 Use De-Fishing Soap in saltwater or fresh water. 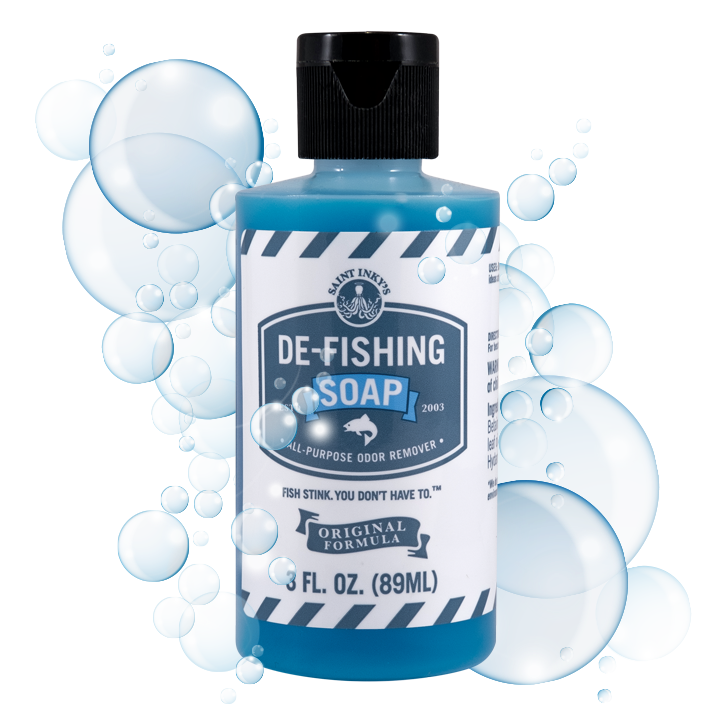 De-Fishing Soap has a low PH value and is very gentle on your hands. Just lather up, scrub (warm water and scrub brush is best), rinse, and repeat. De-Fishing Soap is completely biodegradable, river, lake & ocean safe. Proudly Made In The USA with all natural products. No animal products used. 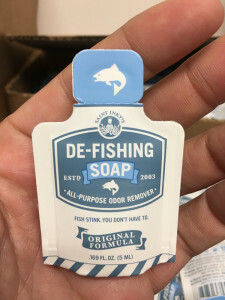 So you owe it to yourself, but more to those around you to give De-Fishing Soap a try and truly be welcomed home after a long day of fishing. And for a limited time, the team at De-Fishing Soap is running a VERY special offer where you can get a full bottle of the soap for just a PENNY! Click Here And Try It Today For Just A Penny!